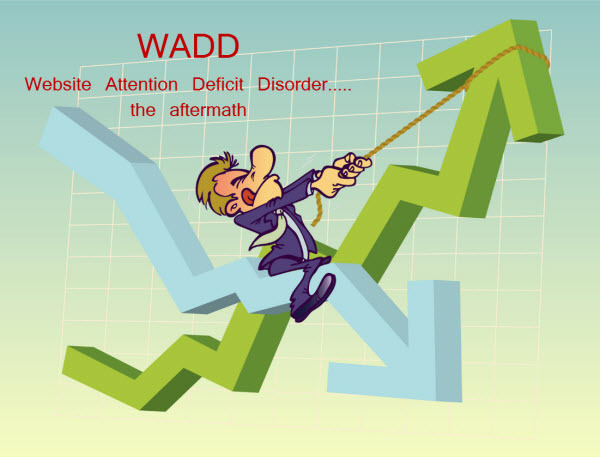 Do you suffer from WADD (Website Attention Deficit Disorder)? You can’t afford to put up a website and leave it just sitting there. The Internet is not static and neither should be your website. Online user behaviour has changed. Mobile search has exploded, social networking has altered the way people connect online, and search is getting more and more personalised. You have to keep up, and you have to adjust your website and online strategy accordingly. If having a website establishes credibility and provides information to potential customers, integrating social media into your online mix is all about building strong relationships with your customers, other businesses, and building loyalty, brand awareness and establishing your online “voice” as an expert in your field. 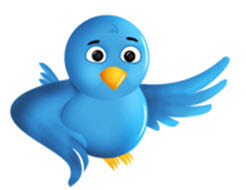 Tweeting up a storm… Are you a Twit? Published March 21st, 2011 by Roslyn Garavaglia Comments Off on Tweeting up a storm… Are you a Twit? Are you a Twit yet? I have to admit that in the beginning of all the social media hype a few years ago, I was one of many sceptics and publically said it was all stuff and nonsense. Do you “Get” Twitter? I could not see the value in writing 140 characters of bite size information and have anyone want to read and respond to it. Why I don’t use the camera on my mobile phone, or upload to Facebook…. 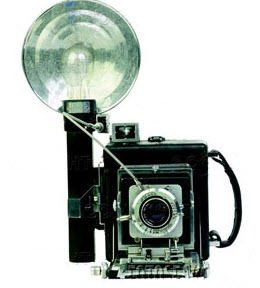 Published February 12th, 2011 by Roslyn Garavaglia Comments Off on Why I don’t use the camera on my mobile phone, or upload to Facebook…. ……or use online albums etc etc. Did you know that your home location may be disclosed by photos you post on the net? What’s Your Marketing Strategy for 2011? Published January 15th, 2011 by Roslyn Garavaglia Comments Off on What’s Your Marketing Strategy for 2011? So you’re tweeting, you’re Facebooking and you’re Linking In. Is that because you understand the strategy of social media marketing or are you doing it because others said you should? If you haven’t set out a strategy or an end goal, it probably won’t work! Link Building has always been part of an online strategy and many SEO agencies offer to do it for you as a part of “Search engine optimization”. Some “professional” link builders hang around blogs, forums, discussion groups, scour the web, looking for anywhere they can dump a link. This method is pretty useless. Others are great link builders who develop valuable links for their clients over time. Published December 1st, 2010 by Roslyn Garavaglia Comments Off on Who Uses Facebook? Businesses, that’s who. If you’re still clinging to the notion that Facebook is a personal space for friends and family, it’s time to change. 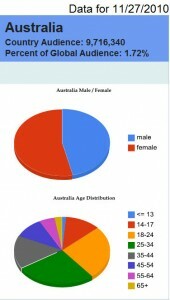 A few Bonza clients have been working on their Facebook accounts and the results are impressive. 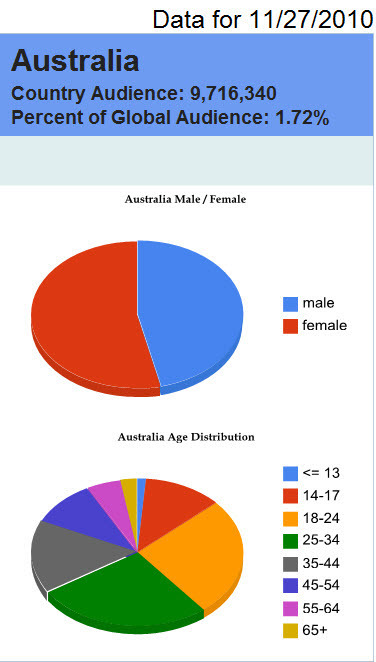 Facebook Demographics. Click here to see a bigger image. Published October 10th, 2010 by Roslyn Garavaglia Comments Off on Do you have a social media strategy? 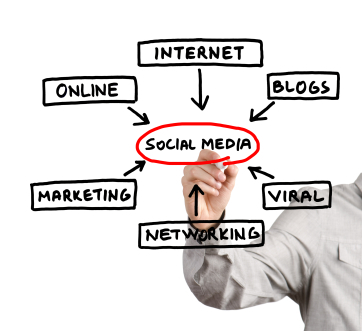 Should you be participating in Social Networking Online? Everyone and their granny are on Facebook! What about you? When I first saw Facebook I wondered, why? Didn’t we already keep in touch via email? When Twitter emerged I was bamboozled and am still not quite hooked. Kevin Rudd, other pollies, and journalists seem to have a handle on it. Wonder what I’m missing….. If you know, tell me. Can either platform help in business? The general consensus is Facebook, Twitter and other social media are valuable tools to engage your customers online, letting them spread your message, exposing your brand to a wider community. Sounds great doesn’t it? Low cost and extremely high leverage when supporters of your brand are spreading your message for you….! It’s not simple. Ask yourself whether your customers would even be using social media. I know many of our clients/customers do and I can identify those that wouldn’t. Careful, don’t assume they never will. Slapping up profiles on a selection of social media platforms won’t cut it. Identify your objectives first and be prepared to put in an effort to provide useful and unique content and keep in mind that it’s not about you! 1. 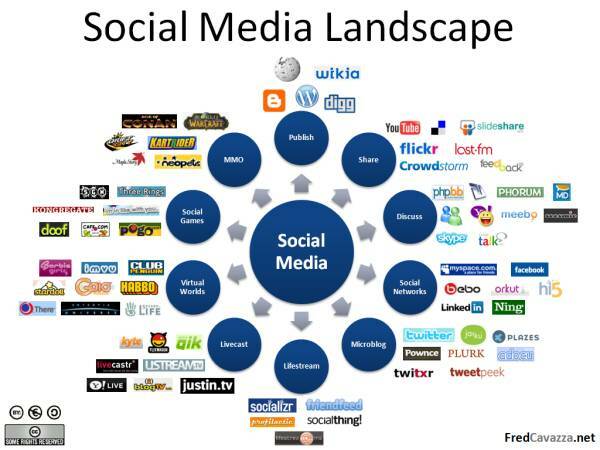 To provide useful information to help you make decisions like this one about social media. 2. To write info, answers, ideas, on a range of topics so you and others are compelled to pass it on or link to it. 3. To build Bonza’s reputation as a creditable resource, one that you’ll want to revisit often because we know “stuff”. 4. Link building to improve our position in search engine rankings. Google loves fresh content. Take it seriously… It involves time and effort and a willingness to participate and share information. Nobody likes self-promotion or blatant advertising. If you build up credibility as an expert in your field and grow a network of true believers because you have great content, they’ll spread the good word. So which platform to choose? Blogging, Facebook, MySpace, LinkedIn, Twitter, Flickr, Photobucket, YouTube, Wikis, Delicious, Digg, Reddit, StumbleUpon, Wikianswers etc. Oh dear, the list is endless! How to start writing content? Once you get into the groove, the time spent on preparing and posting shortens. You’ll probably start to enjoy it too, after all you’re the expert and how easy is it to write about the subject you know best?